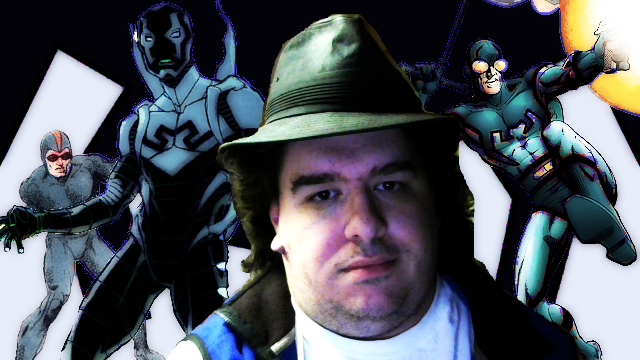 It's no secret I'm a big fan of Linkara, aka Lewis Lovhaug, and what he does over at Atop The Fourth Wall. I've stated multiple times that it's his show is the reason why I got serious about my online presence. Is he the best content producer out there on the web... I don't think it matters, particular when for the past four weeks, he was doing a massive retrospective on the Blue Beetle, from the character's origin as Dan Garret way back in 1939 with Fox Comics all the way up Jamie Reyes with DC comics and the New 52... plus the Convergence event series from last year. Normally Linkara does a MS3K style review of 'bad' comics on a weekly basis, but this was something different. Okay not that different, he did something similar with the Teen Titans that I mentioned briefly when I was doing my review of the JLA Titans mini series (which you can read here: http://fredcasdensbasement.blogspot.com/2016/03/comics-from-basement-jla-titans.html). No, what he did was tackle the immense 70-plus year history of a character that has changed publishers multiple times, has handled by different writers, and has gone up, down and around the bend in being used incredibly well... and incredibly poorly. What impressed me about these past four weeks with Linkara, was how he he approached this retrospective in putting a spotlight on perhaps a character that has been a bit 'forgotten' by DC lately, and showing why DC should be more mindful of how they do things. I thoroughly enjoyed the Blue-Skying series these past four weeks, and because of it, I'm going to check out the Blue Beetle, to see for myself how his story was told. And I encourage you all to head over to www.atopthefourthwall.com to check out Linkara's incredible work this past month, because even if you're not into comics, the craftsmanship of such a project has to be admired.